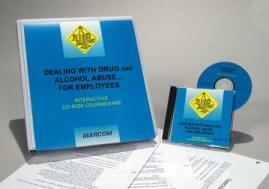 MARCOM's "Dealing with Drug and Alcohol Abuse... for Employees" Interactive CD-ROM Course discusses the various types of substance abuse that are found in the workplace, how they can affect an employee's work situation and what employees themselves can do to help keep their workplace drug and alcohol free. Substance abuse in a huge, worldwide problem. An employee with an alcohol or drug problem can decrease productivity, create a hostile working environment and damage a company's good name. Worst of all, the actions of a worker who is "under the influence" can completely undermine a company's efforts to keep people safe. The course includes information how substances are typically abused by employees, alcohol and other depressants, and their effects, stimulants, narcotics and hallucinogens, and their effects, alcohol and drug policies, helping people overcome substance abuse, and more. Using a powerful combination of audio, full-motion video, text and colorful graphics, this course provides the most cost-effective safety and regulatory compliance training available today. The course is divided into a number of logical sections so information is easily understood... and retained. Also designed with the training manager in mind, all courses in the Interactive CD-ROM Training Library include a learning management system (at no additional cost). Using this system, trainers can set up "Pre" and "Post" tests... establish log-in procedures... even define and set up curriculum for various job classes. The system also collects and organizes employee performance information through a powerful relational database, which can generate a number of record-keeping and tracking reports... and has a database "import/export" feature, which allows information to be transferred to and from an external database (such as a company's personnel database). The course is one of over 100 titles currently available in the Interactive CD-ROM Training Library.